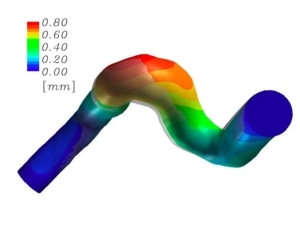 The Deforming-Spatial-Domain/Stabilized Space-Time (DSD/SST) formulation was introduced in [1-3] for flow problems with moving boundaries and interfaces and has been applied to a large class of problems, including FSI. 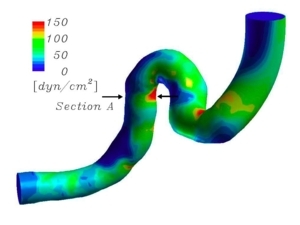 In this joint work with Ryo Torii and Marie Oshima (University of Tokyo), the version of the DSD/SST formulation introduced in  is applied to modeling of the FSI of an internal carotid artery. This joint work is described fully in . The computations were carried out by Ryo Torii, using a computer program he wrote with guidance and help from the T*AFSM. The computer model was extracted from the computed tomography (CT) model of the internal carotid artery of a male patient in his 70s. The inflow boundary condition used in the computations is a pulsatile velocity profile, which closely represents the measured flow rate. In the FSI computation, the arterial walls are assumed to be made of a linearly elastic material, but the geometric nonlinearities are accounted for. 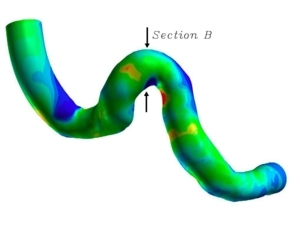 A computation was carried out also with a model where the arterial walls are assumed to be rigid, so that we can see the importance of taking into account the FSI between the blood flow and the arterial walls of a sharply curved artery. In fact, the computations show that taking such FSI into account makes a significant difference in the predicted values of the hemodynamic factors such as the wall shear stress. Fig. 1. 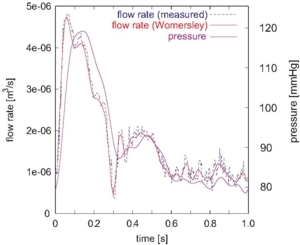 The inflow boundary condition used in the computations is a pulsatile (Womersley) velocity profile, which closely represents the measured flow rate. Fig. 2. Deformation of the artery at the peak systole (colors show the magnitude of the displacement, with the transparent geometry showing the configuration at the beginning of the systole). For details, see . Fig. 3. Wall shear stress distribution at the peak systole for the computational model with elastic wall. 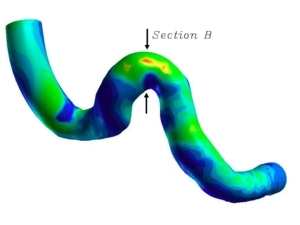 This model takes into account the FSI between the blood flow and the arterial walls. Left: Medial view. Right: Lateral view. For flow velocities at Sections A and B and other details, see . Fig. 4. Wall shear stress distribution at the peak systole for the computational model with rigid wall. Left: Medial view. Right: Lateral view. For flow velocities at Sections A and B and other details, see . 5. R. Torii, M. Oshima, T. Kobayashi, K. Takagi and T.E. Tezduyar, "Computer Modeling of Cardiovascular Fluid-Structure Interactions with the Deforming-Spatial-Domain/Stabilized Space-Time Formulation", Computer Methods in Applied Mechanics and Engineering, 195 (2006) 1885-1895.